Are our products gluten free? Thanks for your interest in our products. We have two lines of products - our Natural Line and our Salon Line. 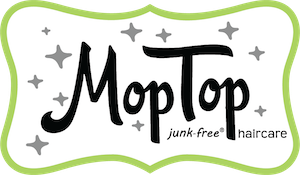 All of the MopTop NATURAL line of products are free of Parabens, Phthalates, Sulfates, Dyes, Silicone, and Gluten. Below is a link to our website and just look for products that say “natural” as opposed to “salon” to purchase. Hope this helps and please let us know if you have any further questions. Remember, a good hair day can change the world!